Egypt’s national security services arrested Tuesday former Prime Minister Hisham Qandil who has been sentenced to a year in jail for failing to execute a court verdict, state news agency MENA reported. "Security forces managed to arrest Hisham Qandil, former prime minister, in carrying out a court order issued against him. He was caught in a mountain area with smugglers trying to flee to Sudan," Egypt's interior ministry said in a statement published by Reuters. In September, a Cairo Misdemeanor Court has upheld an earlier ruling against the former Prime Minister sentencing him to one year in prison for failure to implement the Administrative Court verdict ordering the re-nationalisation of the Tanta Flax and Oil Company. The lawsuit against Qandil was instigated by a number of the company’s workers. The company was privatised in 2005, when it was sold to Saudi investor Abdel-Ellah Al-Kaaky for less than its total value, forcing hundreds of workers into retirement. In September 2011, the Administrative court ruled against the privatization of Tanta Flax and Oil. A year later, the Administrative Court overturned an appeal filed against the renationalisation of the company. Qandil was appointed as Egypt’s PM by deposed president Mohamed Morsi in August 2012, remaining in office until Morsi’s ouster on 3 July. 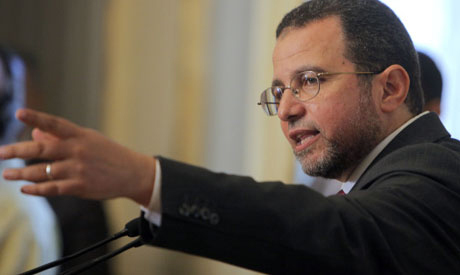 An interim-government led by PM Hazem El-Beblawi was sworn in shortly after. Since Morsi’s ouster, his supporters have been facing a harsh crackdown that left thousands of Muslim Brotherhood leaders in detention. Egypt Coup doing same think what Pheroh did before thousands of years ago,foolish coup fail see body of Pheroh in museum ,If This Coup Didn't stop killing ,Allah May Show his power Insha Allah. This terrorists should have NEVER been released. His game plan was to hide in a terrorist friendly country Like Quatar or England to Guide the Muslim Brotherhood to their next target to bomb. You always speak as thought you are great power who conquered Egypt. You speak about arresting killing and extinction of Islamist in their own homeland. Why so much hate ? Is it love for ruling ? Are you. Vampire ? Islamist do not need to terrorise.. Simple they have majority here in Egypt. Coup leaders are small minorities they have to gain by terrorising Egyptians ..